SAVE when you buy sets! Get a deal when you buy the set of both neck rest sizes. Even better, get the set of both Rock-n-Rollers with the Guitar Bench Pad. In my shop...bit so much better to just buy it. a bit of a splurge for the shop, but I am looking forward to being able to grab one easily instead of making temporary blocks for different situations. 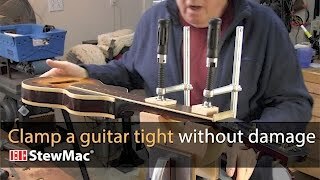 I could have built one myself but this one has excellent cork pads and several different heights that can be used for fret work. This neck rest really is a rock and roller. Whoever designed this simple but extremely effective tool was brilliant. It works as advertised and has enough options to handle just about any task that is used for. I really like the option to set it on its side for smaller necks like mandolins, etc. I've been improvising neck rests for decades, finally broke down and bought the Roller Neck Rest and I'm glad I did. The simple design works really well. What a difference with these rest sets. why I never had them years ago I don't know.. I can recommend them as they are lovely to use. They are well machined and designed and easily stored after use. Well worth the money. sized guitars for what they need. I've been using a short two x four for a long time. Been chasing the neck around for a long time too. I've been watching StewMac vid's for a while now. Always thought this neck rest was awesome. After chasing my whole guitar to the floor. I ordered one. Well, I'll be damned, it is awesome! Add a good clamp to the mix, and I'm a pro from Dover.